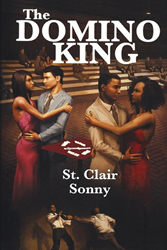 The path to victory is filled with disappointments, romance, danger, and many surprises in St. Clair Sonny's "The Domino King." Chad has been struggling desperately to cope with a life that’s been turned upside down. He’s lost everything: his business, house, cherished BMW sports car, and his fiancée. Having reached rock bottom, Chad is at the point of committing suicide. Linda, who was jilted by Chad, is the only one ready to help him, despite her parents’ opposition. Linda persuades Chad and his partner, Lee, to take part in the first World Domino Championship. But first, they have to come out victorious in the English competition before they can battle it out against other national teams. Which country will win? The hot favourites are Brazil, Saint Lucia, Jamaica, and England. Chad’s path to victory is filled with disappointments, heartache, excitement, romance, danger, and many surprises. Will this once downtrodden man win and be crowned The Domino King? Game on! “This fast-paced novel is part romance, part thriller, and all excitement. We are most pleased to announce its release,” said Robert Fletcher, CEO of Strategic Book Publishing and Rights Agency. About the Author: Originally from the Caribbean, St. Clair Sonny has lived most of his life in East London, where his book is based. Now retired, he ran a successful marketing firm. His story was motivated by his interest in dominos, and he may still one day form The World Domino Federation. http://sbprabooks.com/StClairSonny or at Amazon.com or Barnesandnoble.com.